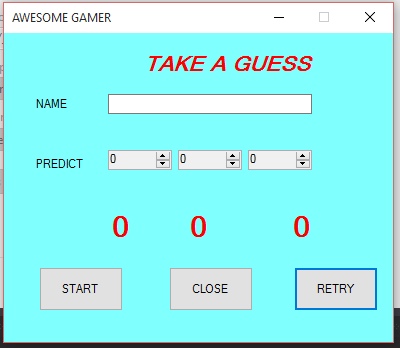 This is a lottery game made in vb.net where a user can predict three consecutive number using numberic UpDown control. For example, a user can enter 2-2-2 or 7-7-7 then click on the start button. The in built random function will loop through a number in-memory and compare it with the numbers entered by the user. When there is a match, then the user emerged the winner.